It has officially become winter in Minnesota over the past week. Snow + below zero temperatures = a not so happy me. Although the snow is beautiful, I must admit. Anyway, wore this outfit yesterday for brunch with some girlfriends downtown. Bottomless mimosas from 10 a.m. to 2 p.m.? I think YES. Okay, I actually only had a couple because I would have to venture back out in the snow as you can see in these pictures. You look stunning Rachel, I can’t believe you have all this snow already. It’s so pretty. Love your style! Your hair looks gorgeous! You look gorgeous! I love the stripes with the denim vest! 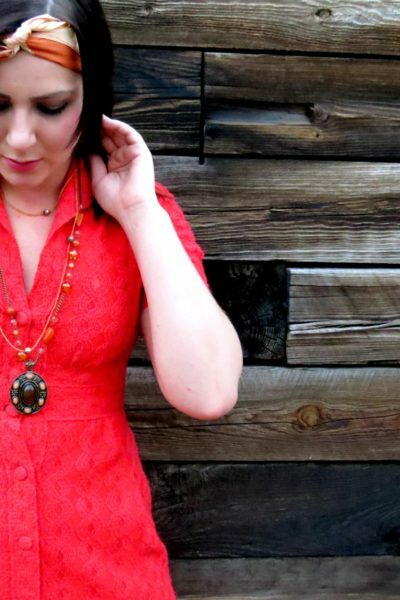 Um, hello–you hair looks epically amazing here! And I love the stripes with the jean vest. Such a cute combo! your hair looks absolutely perfect here and i love those booties! Excuse me as I whistle at you. HOT DAMN LADY! You are looking fine! Your hair looks so pretty curled and the snow makes for a beautiful background! Stay warm! 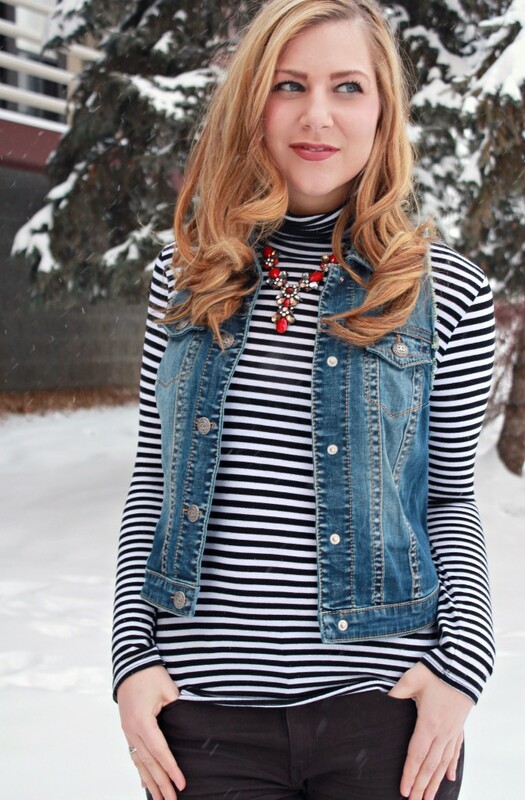 loving the stripes and denim vest together! looks good! so pretty! love the look! That necklace is soooo nice. So jealous of your snow! You look beautiful! what a cute look. i love the stripes with the denim vest! You look beautiful! I love the denim vest with the striped top! I love this outfit! And ee, i couldnt even imagine it being 0 degrees! Thats crazy! It hardly dips below 20 here in Philly during the winter. Im obsessed with your necklace by the way! hello hun..cute outfit… wanna follow each other? just tell me if u follow me, then i'll follow u back immediatley. Wow!! These photos are gorgeous Rachel! We got some ice this past weekend, and it made for some great blog photos. Loving your stripes! Rad photos Rachel. I wish it would snow here in Winter… We still waiting for summer to kick in here! Haha, the snow is beautiful, but it has made the drive to and from work so awful over the past week! I’m obsessed with your hair here! These photos are beautiful, you are beautiful! Thanks Rachel!!!!!!! Curlers do wonders for my hair, much more than me trying to curl my own hair (usually ends in disaster) and thank you! Great look for brunch! I adore your booties. And bottomless mimosas are always a must! I really love that striped top! Very nice winter look and the necklace adds a cute color pop. I am having a winter giveaway and I hope you enter it. Its a great giveaway for a $150.00 shopping spree. Haha! I love you Ashley 🙂 Thanks girl! Hello! Thank you for your comment 🙂 I would love to follow you! Girl, you look so gorgeous!! I’m loving the snow pics. And your outfit is SO cute for winter! Love love love. you are brave to stand out with no coat on in the snow. SO cute!! Love that striped turtleneck! And the snow is so pretty! Stay warm!! How pretty! This might be the most successful denim vest moment I’ve seen. Noice. And brave of you to stand in the snow that long! Brrrrrrrr. I think you just became my favorite person ever for saying Noice 😀 LOL! Love it. And yes, it was VERY cold. I think we were out there a total of 5 minutes, snap snap snap, let’s get back inside to the warmth! The stripes and vest look so cute together, not to mention your gorgeous necklace! Hope you are keeping warm! Super great look! Love how you paired the jean vest with the rest! 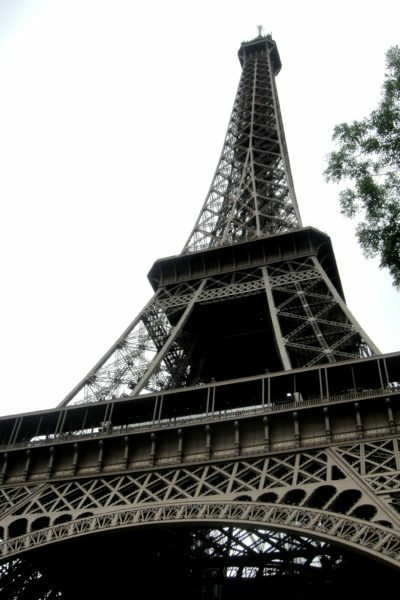 Was looking over you blog and i enjoyed it! Love this look! 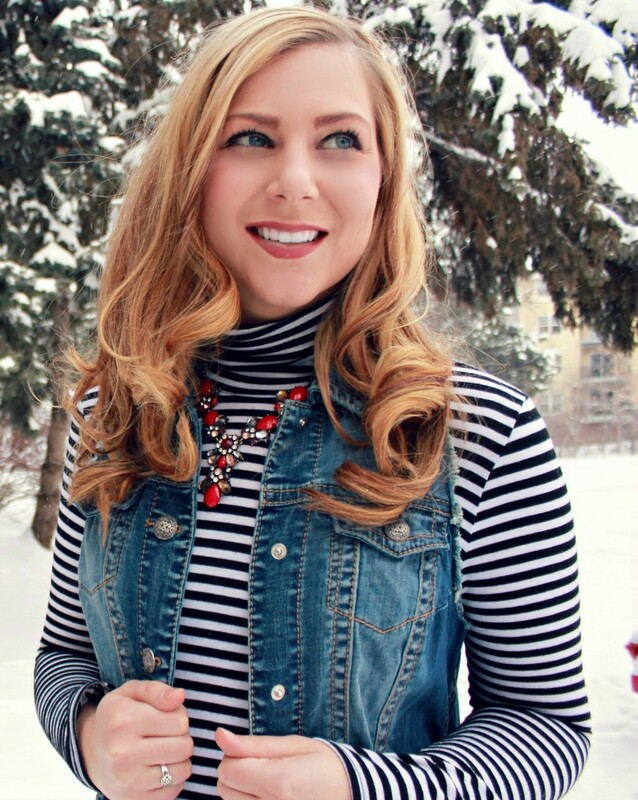 I’m such a sucker for turtlenecks and statement necklaces… and stripes for that matter! So chic! My my my look at all that snow & it’s not even winter yet. But you are certainly looking so gorgeous in that ensem Rachel. A stripe tee over anything is a winner for me! You look beautiful. I love your striped top. Stay warm, girl! I am digging the striped t-neck with the bold necklace! You look gorgeous, per usual and loving your hair like this!! Stay warm…I don’t think I could handle those temps…my Texas blood would DIE!! So chic in the snow! I can’t wait for snow this Christmas! I have a love/hate relationship with the snow too! Love the striped top and denim vest! Gorgeous Photos! Bottomless Mimosas… Right up my alley 😉 Love your site! 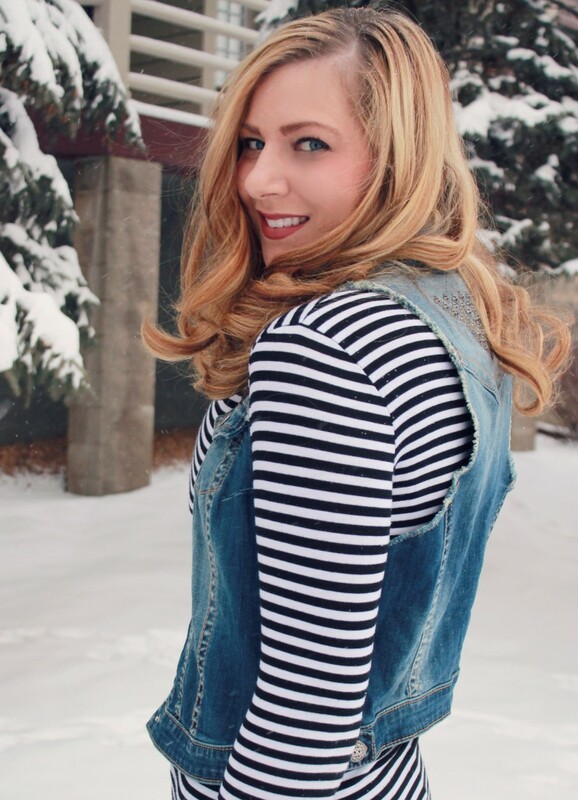 Love the striped turtleneck with the denim vest! I’m still missing a denim vest in my closet or else I would totally copy this look! You make one stunning snow bunny pretty lady! Loving the stripes + denim vest! 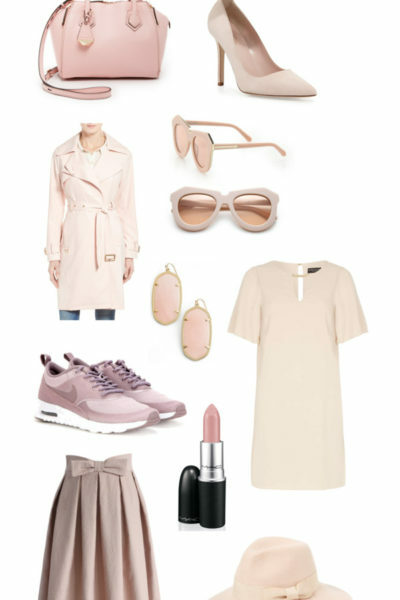 Such a cute outfit for brunch! I love the turtleneck with the statement necklace and your hair looks perfect! I love this casual winter look and those booties are amazing! Bottomless mimosas? Seriously why don’t I live closer? !